Sew & Tell: Handmade & Hand-me-down Fair: Profile: Belinda Smith of "Pins and Needles"
What are you selling at Sew & Tell? I am selling children's clothes made from Enid Gilchrist Patterns and some of my porcelain artworks inspired by my domestication as a mother. 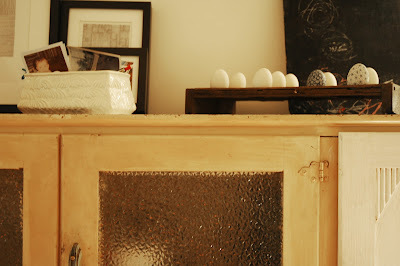 My good friend Julia Barron is joining me with her trove of vintage domestic objects and handmade goods. A. I’m knitting and crocheting for my kids at the moment but I’ll try anything! A. Mum was always doing something crafty, so were my grandmothers. What I haven’t learnt from them I have learned myself. A. The satisfaction of making something useful or beautiful. A. Exhausted – a toddler and 3 month old baby are keeping me busy plus a new creative business venture. A. A vintage cupboard that my grandfather made for my granny. It was a glory box first, then a radio cabinet. Now it lives at our house. A. Sweden to see my sweet friend Maria and meet her kids. We haven’t seen each other for 5 years and have both had kids since. A. A huge school blackboard with a timber frame and chalk ledge. It is the centerpiece of our little house.